Now and then there comes a book that takes you out of the mundane and ordinary, even for a highly visionary genre as science fiction, and drops you into a new reality, redefining expectations and reigniting hope that maybe there is something to look forward with written novels. For me, these books were Ringworld, Neuromancer, Snow Crash, Accelerando. 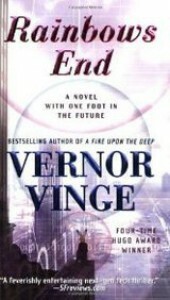 And now this Hugo winner from Vernor Vinge. Yes, the book is hard to get through but only because it's forcing you to think in new ways. In terms of what it has to say about the future, Vinge resonates with how I feel and what I see around me. This is a new form of cyberpunk, more like geriatro-punk, but mind-bending just the same, and carried on the same gritty cloth of a harsh reality - aging.